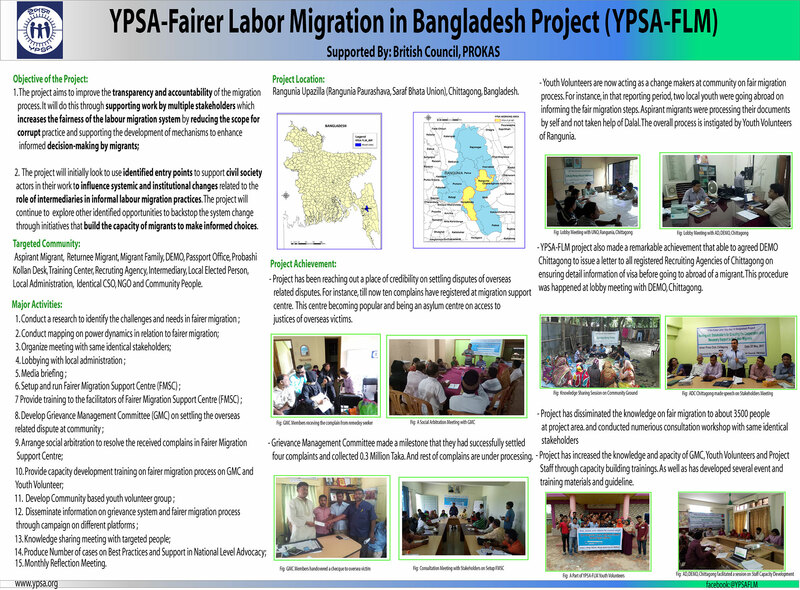 YPSA-Fairer Labor Migration in Bangladesh Project has attended the 2nd Quarterly Reflection Workshop on 16th July 2017 at Spectra Convention Centre, Dhaka. 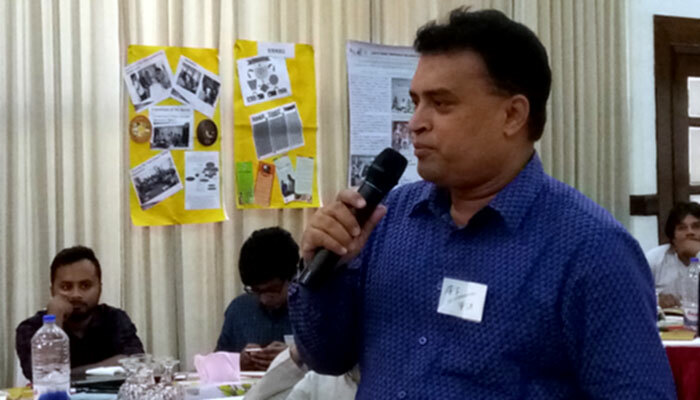 This Quarterly Reflection Workshop was jointly organized by Campaign for Sustainable Rural Livelihoods (CSRL) and Welfare Association for the Rights of Bangladeshi Emigrants (WARBE) Development Forum. PROKAS (Promoting Knowledge for Accountable System) is currently supporting two issue based programme; Climate Finance Transparency Mechanism (CFTM) Project and Fairer Labor Migration (FLM) Project. There are ten different implementing partners of these two issue based project (IBP). 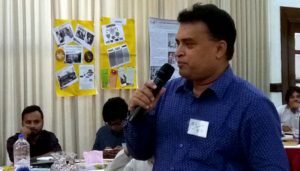 BCAS (Bangladesh Centre for Advance Studies), CSRL (Campaign for Sustainable Rural Livelihoods), COAST Trust, C3ER-BRAC University and ICCCAD (International Center for Climate Change and Development) are the partner of CFTM Project. On the other hand, BOMSA (Bangladesh OvhibashiMohilaSramik Association), IID (Institute of Informatics and Development), RMMRU (Refugee and Migratory Movements Research Unit), WARBE DF (Welfare Association for the Rights of Bangladeshi EmigrantsDevelopment Forum) and YPSA (Young Power in Social Action) are the implementing partners of FLM. 3. To identifying Thematic and Operational Issue for Collective Actions considering outcome and inputs of different session. Workshop methods were participatory and interactive. All the participants were spontaneous to receive the knowledge and involved in brainstorming discussion, group work, question and answer, experience sharing. During the sessions, the partners were divided into several groups to perform the simulations. The facilitation was conducted using flip chart, poster presentation and power point presentation. To informing achievement and identifying risk and challenges, every partners were presents a colorful poster presentation where mentioned the achievement of last quarter. Likewise YPSA-FLM has presented a colorful poster which attracts most of all participants. As well as in identifying risk and challenges YPSA has identified some specific challenges as well mentioned the mitigation strategy of these challenges. In like manner all partners are sharing their challenges and mitigation strategy as well. She also said that PROKAS going to extend the coverage area of YPSA. And they are intent to work in Cox’s Bazar. The coastal areas of Cox’s Bazar have been using for human Smuggling/Trafficking through irregular maritime movement for a long Time. The Andaman Sea crisis bears this testimony. YPSA now working on the reintegration of Andaman returnee. So, this extension might play a vital role on stopping illegal migration on south eastern coastal area of Bangladesh. After the discussion the panelists were agreed on taking effort forClimate Displacement. Panelist said that to overcome this issue we have to take collective effort and sustainable action. If we fail to take sustainable effort and action on addressing of climate displacement than a hazardous moment are awaiting for us. Finally forum was taken a decision the will prepare a concept paper on Climate Displacement which may another issue of IBP. Forum also taken a decision that next quarterly reflection workshop will organize YPSA and BCAS. Program Manager Presents the challenges and mitigation strategy an output of a group work of YPSA team. Chief Executive of YPSA Md. Arifur Rahman took part in a discussion on a thematic session. The panelist forum in thematic and operational issues for collective action.